Do You Remember the Black and White Game? The Black and White video game was all the rage back in 2001 when it was released by Lionhead Studios, and though it may seem very antiquated now, compared to new games (like the glorious WoW), this old-fashioned video game was very exciting at the time. The nostalgia some members of the Game Guide World team still have for this game is the reason why we decided to present it to you today: even if we won’t convince you to play it, necessarily, we may at least reminisce together about the lovely concept that stood behind it. To cut a long story short, this concept that made the game so interesting (and strangely addictive) is the fact that it is a god game. In other words, while playing it, you are a god in your own right, designing a world, making commandments to your subjects, sending a holy animal to speak to them as your emissary, punishing or rewarding them and so on. The possibilities are endless: you aren’t even bound by traditional notions of morality and ethics: if you decide to reward or punish your subjects unjustly, or smite them or send a flood for no particular reason, you’re free to do it without repercussion. On the other hand, you can perform miracles or intervene in a beneficial way just as randomly as you can punish out of the blue. There are no rules to bind you, and a god game should be just like that. One of the funniest aspects of the Black and White game is the fact that you can treat not only your subjects as you feel like, but your holy animal (which acts as your spokesperson) as well. If you want to pet it, you can just gently move your cursor on it and it will act out just as if you’re gently caressing it. 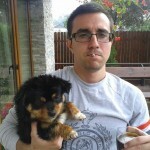 If you start to move the mouse faster and with a wider motion, the cursor will instead strike the poor beast, in a way which could end up making animal lovers cringe (and for good reason). Though such a scene may seem pretty graphic and disturbing, our opinion is that it should be taken in good fun: after all, it’s just a video game, and while the game doesn’t impose any moral laws on you, how you behave in the game is up to you. You decide what kind of a god – benevolent or wrathful – you want to be. The only binding aspect of the Black and White game is the fact that once you start down a path, it may get hard to recover from it. Your pet and your subjects will learn to expect certain things from you, and changing your behavior suddenly won’t immediately change their expectations. But the good part is that you can always start over, and you can save sessions of multiple games in parallel, if you want. You will also have an antagonist to fight against (another god, your creature’s former master, who wants to reign supreme over all of the other gods). As you progress through the game, you will gain more power and be able to do more things. Initially, you are born out of the prayers of a single family, in their moments of desperation when they’re about to see their son drown. 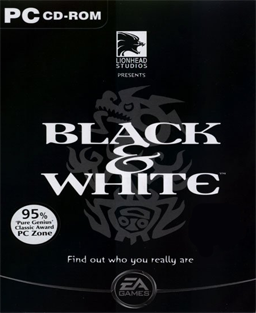 To get on with some of the technical aspects of this game before we go too deep in a rant about it, the Black and White game is available for both PC and Mac and it was rated as over 90% on Metacritic and Gamerankings, which should speak volumes about how clever the game’s concept is. The game’s AI is actually complex enough to make your pet intelligent and teach it how to perform complex tasks which reflect your gameplay. In other words, the AI learns from your behavior and ends up imitating it almost perfectly. All this is just a fraction of the wonders which will be revealed if you give the Black and White game a chance.